Hi, friends! I hope you had a great week! 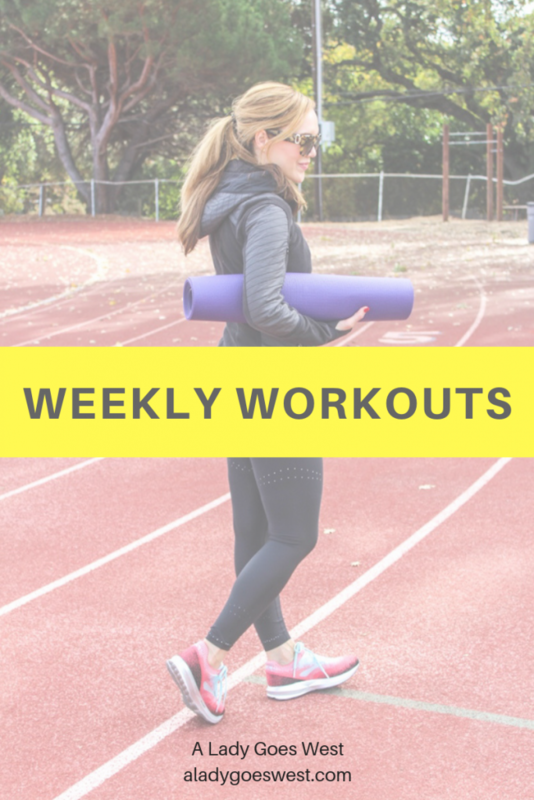 Thanks for stopping by the blog today to read our usual weekly selection of favorites in food, fitness and life — it’s a chance to ramble and keep it light. I’ve got a healthy snack giveaway coming your way today too. This book! It took everything in me not to mention “Becoming” as a favorite every week I was reading it until I finished it just a few days ago. I loved this book. There was no official co-author on the cover or label, so I’m led to believe that Michelle Obama did her own writing (with an editor and fact checker, of course), and if that’s the case, she is one of the best storytellers ever. She somehow goes back and forth through memories giving the most minute details, yet it all works out for the overall narrative in an amazing way, you never get lost, and you definitely never get bored. “Becoming” starts when Michelle is young and living in the South Side of Chicago with her parents and brother. It goes through her youth in the “Becoming Me” section, moves on to when she met Barack in the “Becoming Us” section and continues as the Obamas live in the White House in the “Becoming More” section, closing just after they were about to return to civilian life. I’ve never spoken about politics on the blog, and don’t intend to, but I will say that I’ve always liked the Obamas, and I’m so glad I now know so much more about them. After reading this book, I LOVE the Obamas through and through. Michelle Obama is the real deal. Somehow she makes all the right decisions and has helped so many people throughout her life. She’s helped people to become better versions of themselves, and she’s helped people to have confidence in themselves too. She stresses the importance of making everyone feel like they belong, and that is so necessary in every part of life. She stresses the importance of education. And she stresses the importance of knowing that no matter where you start, you have a chance to succeed. Amen! 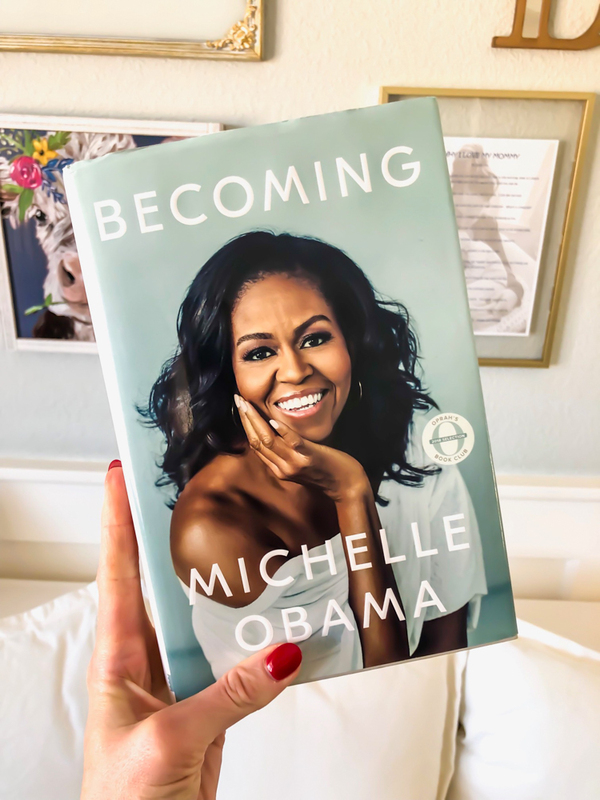 There’s so much more I could say about this book, but here’s the gist: “Becoming” is mostly an autobiography of Michelle Obama’s life — it’s not about politics — while it does cover what it’s like to campaign and then live in the White House — it’s just about being a really good person, promoting inclusion and working hard. Yet, all those lessons unfold as Michelle Obama talks about her life, so it’s not at all a motivational or self-help book, it’s just real. Reading “Becoming” has made me think about how I can help others in my life a little bit more. Maybe there’s more to coming on that. Who knows. But seriously, if you like a long enjoyable non-fiction book about a fantastic woman, then “Becoming” is for you. This past Saturday, Dave and I drove up to St. Helena in wine country to have brunch with my college girlfriend, Sandra, who was visiting from Louisiana. I haven’t seen Sandra is FAR too long, and it was so nice to catch up on life. She’s getting married this summer in Europe, and sadly, Dave and I won’t be able to go, but it was so wonderful to meet her future hubby this weekend. 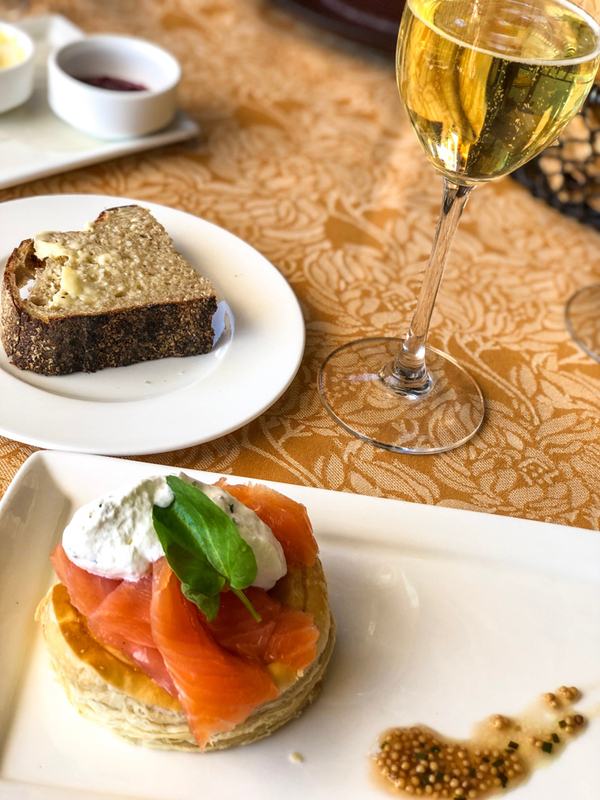 Side note: I had never been to Auberge du Soleil before, and it’s a super fancy hotel and our brunch was delicious. It’s up on a hill, and you can see so much of wine country from the outdoor seating area. Loved it. Also, we had a three-course meal, and the smoked salmon tartlet shown below was the stand-out. Yum. When you think of protein cookies, you probably don’t think of something that’s tasty but also has a pretty clean ingredients list, right? Well, now you can. These Munk Pack soft protein cookies are my FAVORITE, and I’m so happy I have a chance to give away two sampler sets to one lucky reader. They have 18 grams of plant-based protein, are non-GMO, vegan, dairy free, gluten free and full of flavor — almost too good to be true. I like to have one in my purse at all times, because these days I have to share my snack with Brady, and these are big enough for that. Did I mention they are cookies? To enter, all you have to do is leave a comment on this blog post. Head to the end, click on comment and enter your information — your email will not be publicly shared, but your comment will show up on the blog. Good luck! You must live in the U.S. to win. And you MUST be following both A Lady Goes West and Munk Pack on Instagram too. I’ll choose a winner next Wednesday and announce on the blog next Friday. By the way, I’m also running a giveaway for Munk Pack cookies on Instagram, so if you haven’t yet, here’s another chance to win. Wednesday: Practiced 25 minutes of BODYATTACK, 10 a.m., taught 1-hour barre class, 5 p.m.
Thursday: Taught 1-hour barre class, 12 p.m., practiced 25 minutes of BODYATTACK, 4:30 p.m.
Friday: Practiced 45 minutes of BODYATTACK, 11 a.m.
Saturday: Practiced 20 minutes of BODYATTACK, 15-minute weights workout, 10 a.m.
Sunday: Practiced 45 minutes of BODYATTACK, 11 a.m. This past week was NOT my usual week. No rest day? Not cool. However, I was gearing up to teach the brand new BODYATTACK this week and felt like I needed another run-through on Sunday, which is usually my rest day. Other than that, I had some variety, and I will be sure to have a full rest day (or two) this upcoming week and probably no double days either. Dirty dozen. A new list from the EWG is out with the dirtiest and cleanest fruits and veggies. Good news: You can still buy your avocados conventionally, because the skin is so thick they are rarely tainted with pesticides. Organic is always preferred, but remember, it’s better to eat regular fruits and veggies than none at all, if cost is an issue for you. Foam rolling. I’ve been foam rolling BEFORE my workouts for forever, because it gets the muscles ready. This is a short article on why before is the best time. Beauty gift. In need of safer skincare, makeup or body products? Right now, if you spend $125 or more with Beautycounter, you get a free brightening face oil. Let me know if you have questions or need help! 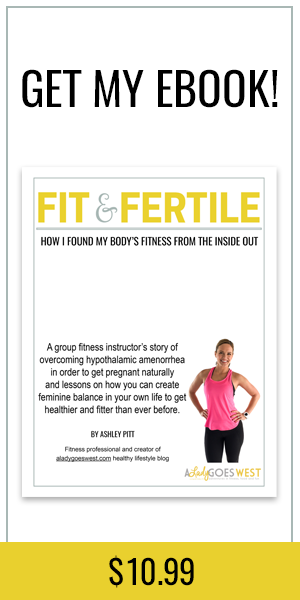 Postpartum fitness tell-all. Thank you SO much for the love on this post. 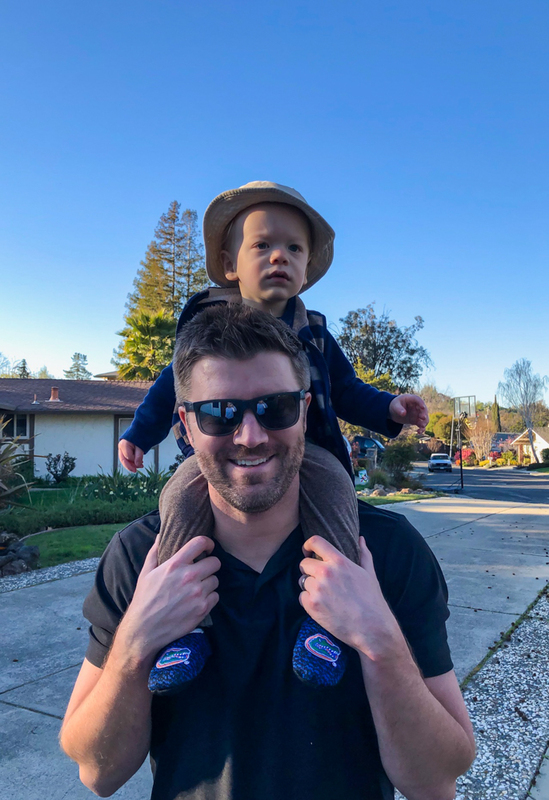 Clearly you guys are interested in the down-and-dirty details on the postpartum phase … “Five things no one tells you about postpartum exercise.” Please let me know if you have any other topic requests. 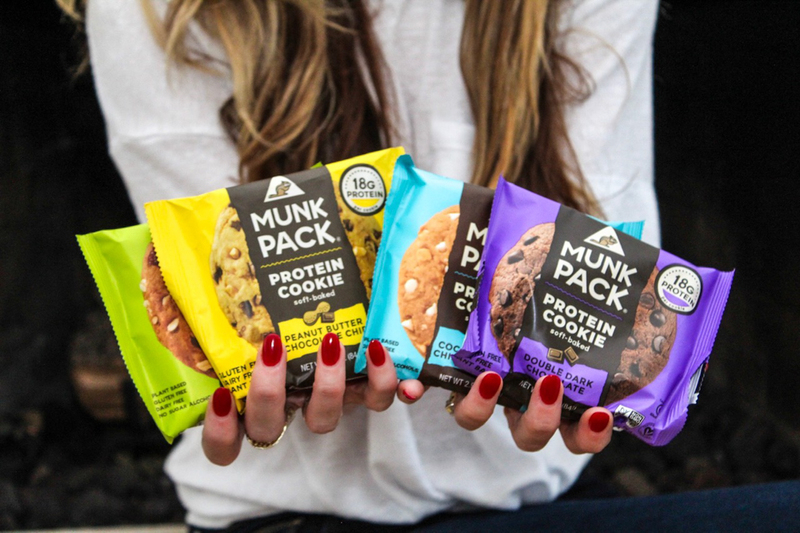 Which flavor of Munk Pack cookies are you most excited to try? I’d love to try the cookies, especially the chocolate chocolate chip one! Currently training for a marathon and always need healthy, high-protein snacks! Hi Tara! Good for you! Have you run a marathon before? Where and when? And YESSS you better fuel up properly for all that movement, and these cookies are perfect. Happy Friday! I LOVE Michelle Obama too. Haven’t read her book yet, but it’s on my list. True statement right there — winning food makes it even better to have that food. hahaha! Hope your week was a good one, my friend! 🙂 Sending you love! <3 <3 <3 Love the Obamas! Thank you for sharing about Michelle's book. Regardless of their politics, I always valued that they seemed like genuinely kind and caring people (who truly love and respect each other) – something far too often overlooked! Hi Kaitlyn! Yes, I feel like you can tell when people are really just good people — and they ARE!! 🙂 We need more examples like that out in the world. Happy Friday to YOU! Your meal looks so pretty. 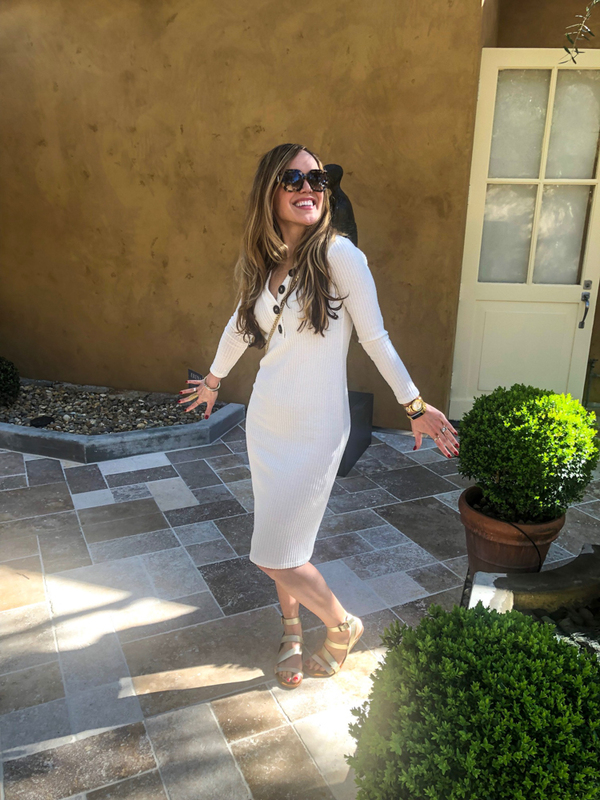 I’ve been to a L’Auberge restaurant in another state and it was divine. I LOVE Munk Pack cookies. but haven’t had one in awhile. I can’t remember my favorite variety. Hi Annette! Oh cool — I didn’t originally know that there were other locations of the hotel. Hope you have a happy Friday, lady! Your review of Becoming has me moving it up on my to-read list! It’s been sitting on my shelf for months. So far this year, the best book I’ve read is A Spark of Light by Jodi Picoult. Could be controversial, but I thought it was well done. This weekend, I’ll be celebrating my husbands birthday. And for those cookies, the peanut butter chocolate chip ones are calling my name! That lunch spot looks amazing as do those cookies! Sounds like a lot of fun and I love fancy places too! Oh gosh I think I commented before when I was reading Becoming – it was SO good. My fave book of the year so far. I loved hearing of her early life growing up. Fantastic. 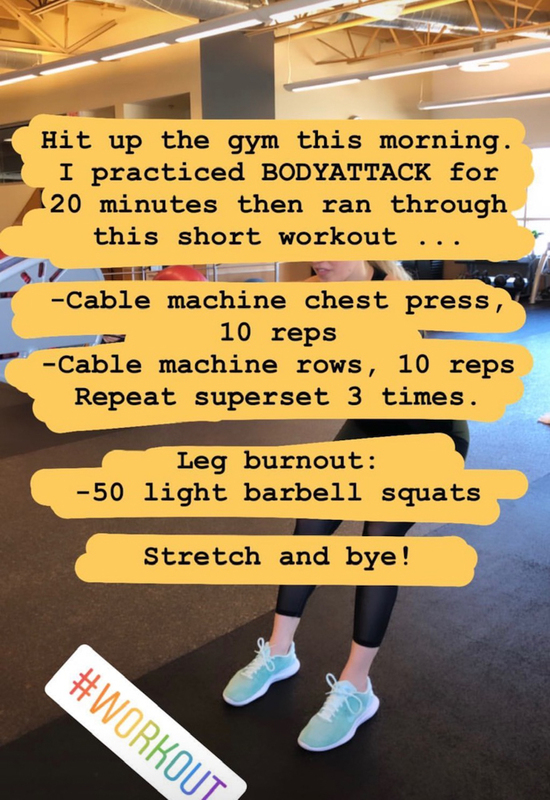 Just noticed Body Attack is 45 minutes at your gym – must check if my gym has any 45 min classes instead of the full hour – I need to get back to it and I used to really struggle by the end of the 60 min class. Truth be told I would be struggling after the warm up hehehe. Hi lady! Yes — we now have a few BODYATTACK Express 45-minute classes, which is what I teach — then we have a few full-hour ones. You don’t do either aerobic track 3 or 8 in the Express versions – so I miss those, but I love that it stays pretty intense the whole time. 🙂 BODYATTACK will always be a challenge for us all — and that’s why we love it! Hope you have a great weekend too! Thank you for another great blog! Excited to try the cookies. What kind of dog do you have? Hi Kristina, Rudy is a maltipoo and he’s four years old! 🙂 Do you have any pets?? Just a hamster and bunny. Love to get a dog!! I’ve always seen these and want to try! I too loved Becoming. I listened to it on Audible and it is Michelle reading it. Hearing it in her own voice added another layer to it. Before reading any other autobiographies I’m going to check if the author has done the audio book. Lauren! I’ve never done an audiobook before! Would love to hear the author read it — such a good tip. Happy Friday! Double dark chocolate! These look delicious and I am always trying to find good snacks for me and my little one. Half way through “Becoming” and loving it as well! Michelle Obama is an inspiring individual. Hi Sheila, She soooooo is! I love her writing and pretty much everything about her — enjoy the book! I felt the same way about Becoming. It is a book I will treasure! Same! I saved it! I often give away or donate old books, but this one I want to keep! 🙂 Happy Friday, Angie! Yum! Would love to try the protein cookies. I’d love to read that Michelle Obama book. Definitely adding it to my list! I would also love to try the dark chocolate Munk Pack cookies. They sounds so good! I’m always most excited to try peanutbutter chocolate anything! I also LOVED Becoming. I keep telling everyone I know that the writing is just so beautiful. I never thought I’d be able to describe the writing in a memoir in that way but I was blown away but the elegance of it (yet, it was a really accessible read). my week was okay. michelle obama seems like a cool person to know. these cookies look amazing. Totally wish I knew Michelle Obama in person hahah! 🙂 Thanks for saying hi, Rana. Have a great weekend! On the docket for the weekend, I have a car show which I am super pumped for as I just got my new wheels and tires mounted yesterday. (Cars are one of my hobbies!) I also have a 10 mile long run, but the weather is supposed to be nice so I am looking forward to the sunshine. How cool are you with the car show??? That’s a very interesting hobby, Amanda! 🙂 Hope your run goes well too!! I’ve never heard of Munk Pack but now I’m super excited to try them! They look awesome! I just finished Where the Crawdads Sing by Delia Owen and Oh. My. Goodness. It was SO GOOD. I didn’t expect to love it the way I did. It’s always great when a book takes you by surprise (in a good way)! Hope you have a great weekend! Hi Lauren! I’ve heard of that book, but don’t know much about it — thanks for the tip! Loveeee to be impressed and surprised by a book! Have a great weekend, lady! I loved Michelle Obama’s “Becoming”. I was at her book tour event last night- and it was amazing to listen to her speak live. She is so inspiring and such a warm individual- last night she was speaking to about 10,000 people, but yet you felt like she was speaking directly to you. I love that she is so motivated to furthering education for everyone – but especially to women and minorities. SO coool you went to her event, Sarah!! Love that! I can only imagine what an amazing public speaker she is, her presence can be felt! 🙂 Hope you have a great weekend! I LOVED Michelle Obama’s book! It’s amazing and so is she! 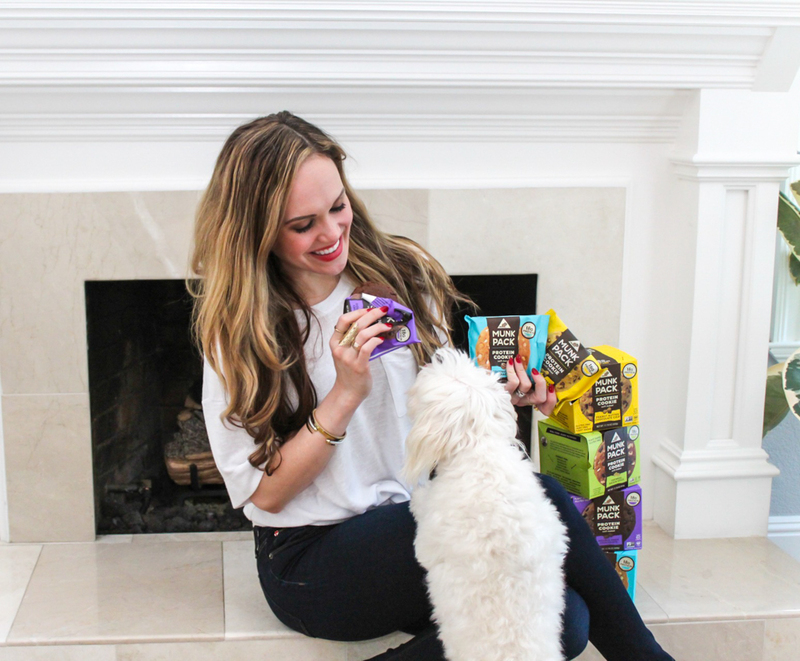 I really want to try those cookies, too — it’s so hard to find high-protein treats that are vegan and gluten-free! I love the name of the cookies “Monk” they look really delicious too! Would love to win the sampler pack of those cookies! Also “Becoming” is on my reading list – your comments made me want to read it even more! Hi Kim! Yesss! Hope you read it soon and enjoy it as much as I did. Have a great weekend! I love how healthy these Monk cookies sound and the flavors sound delicious too! Peanut butter would probably be my first pick. Thank you for the updates and review for us! Peanut butter is almost always my top pick too! 🙂 Have a great weekend, Renata! So glad to hear your thoughts on Becoming. I’ve had it in my Kindle for awhile but haven’t gotten around to reading it yet. Because of all of the amazing reviews, I’m almost iffy on starting it because I don’t want it to disappoint haha. But maybe I’ll finally begin it this weekend!! Congrats on rocking launch week! What did you think of BP 109? So many pushups…love it! I haven’t done BA 104 yet, but very soon. The Coconut White Chocolate Macadamia Nut…sounds delicious. I think BP 109 is great because it’s DIFFERENT — I love to see the step added back to the lunge track and the moving push-ups. It’s totally hard though — WAY harder than some other releases. 🙂 Hope you like BA 104!!!! Have a great weekend, Sheila! Love the idea of sharing those cookies with Brady. Happy weekend girl! Thanks, babe! I hope your weekend is great too!! The double dark chocolate cookie looks great. I like that they have 18 grams of protein. Yup! They are delish too. Hope you have a great weekend, Kelly! Yum!!!! 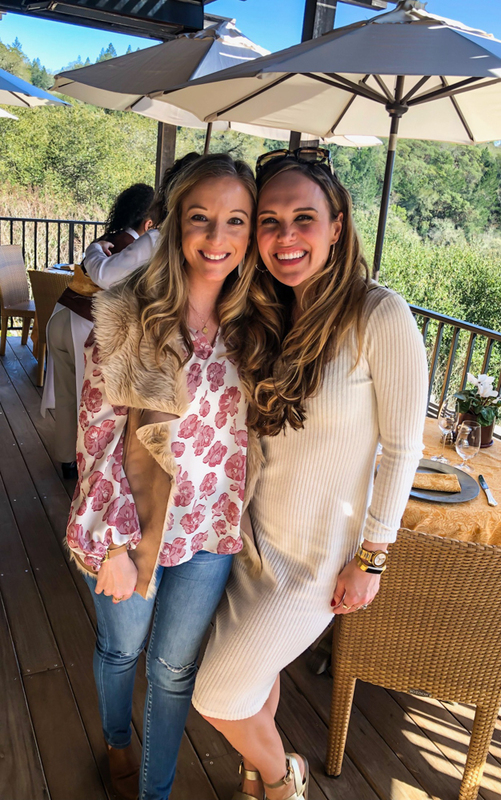 I am in Texas visiting my sister with my daughter this weekend-so fun! I’d love to try the cookies! Thanks, Deidra! Hope you have a great weekend! Wow healthy and nutritious cookies these sound amazing to taste! I’d love the chocolate ones and thank you for the giveaway! Thanks for reading, Georgiana! Hope you had a great weekend! I would love to try the peanut butter chocolate chip flavor! Excellent review of ‘Becoming,’ Ashley! I so enjoyed reading your thoughts. Like Lauren, I am an Audible fan. I had trouble taking my AirPods out once I started Mrs. Obama’s beautiful biography! Apparently I need to get on the Audible train, because I keep hearing great things about it! 🙂 Thanks for reading and say hi! I’ve also read Michelle’s book [we’re on a first name basis if you didn’t know 😉 ] and loved it! I like that these have 18 grams of healthy protein and they are cookies too! Peanut butter chocolate chip would be tasty to try! I am most excited to try the peanut butter chocolate chip cookie!! The Double Dark Chocolate Cookie is the one I’d like to try most.